They're made around rings - I can do free form rings, but I like the stiffer version - not the floppy things I've seen others wear. 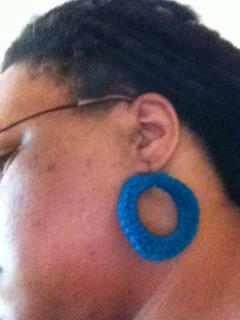 The girls in the group I'm in makes some beautiful earrings. Maybe I'll just purchase from them. This pair is a little smaller. 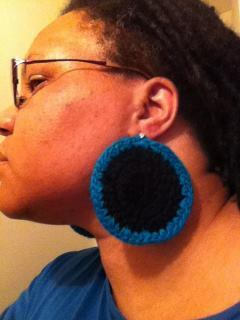 This was the first pair I made. I'm thinking I'll wear these this week, see the reaction I get. Anywho - I'm still working on my blanket. LOTS of squares! I didn't like how the larger squares were turning out, so I changed them to a different granny. I can't wait to put them all together! Of course as soon as I do I'll post a picture. How do you feel about the earrings? I know!! I wish there was a better way. Trying to crochet in these little squares is ridiculous!